The Transportation Security Administration (TSA) wanted to become better aligned with the public’s need for information to make travel safer and airport checkpoints less stressful. They believed (and we agreed) that their website was a good place to start meeting traveler's needs. 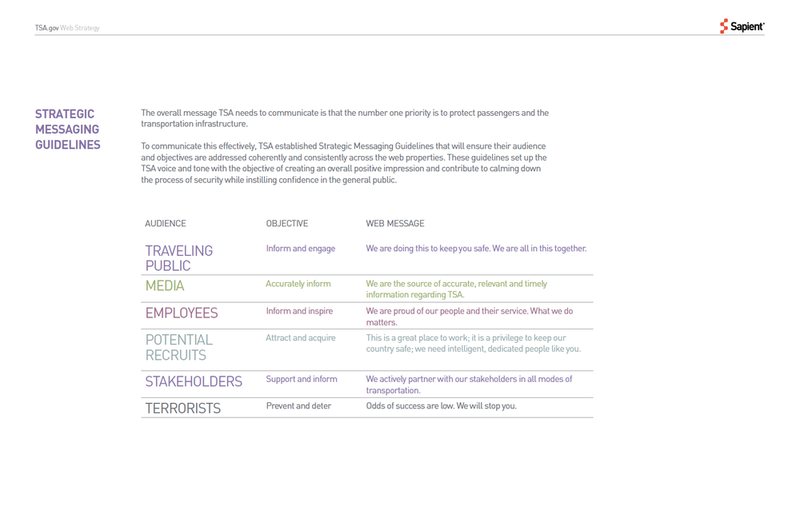 Communicating travel requirements prominently and in the correct tone. The ability to quickly understand what items are prohibited. The ability to find out wait times at various checkpoints nationwide. The ability to provide feedback. We also focused on portraying TSA employees in a different light and sharing ways that the TSA was trying to make traveling less stressful will still putting a premium on passenger safety. *NOTE: this project took up most of 2008, an election year. And as the year came to a close, the lame duck administration had one foot out the door, and sadly, with them went all this work. With a few small exceptions, the TSA.gov of 2008 has remained primarily unchanged to this day.